Transposition of native chromatin for fast and sensitive epigenomic profiling of open chromatin, DNA-binding proteins and nucleosome position Buenrostro et al. (LA: Greenleaf), Nat Methods. 2013 Dec;10(12):1213-8. Single-molecule dynamics of enhanceosome assembly in embryonic stem cells Chen et al. (LA: Liu) Cell. 2014 Mar 13;156(6):1274-85. Characterizing the genetic basis of transcriptome diversity through RNA-sequencing of 922 individuals Battle et al. (LA: Koller) Genome Res. 2014 Jan;24(1):14-24. Comparison of D. melanogaster and C. elegans developmental stages, tissues, and cells by modENCODE RNA-seq data Li et al. (LA: Brenner) Genome Res. 2014 Jul;24(7):1086-101. Determination and inference of eukaryotic transcription factor sequence specificity Weirauch et al (LA: Hughes) Cell. 2014 Sep 11;158(6):1431-43. A community effort to assess and improve drug sensitivity prediction algorithms Costello et al. (LA: Stolovitzky) Nat Biotechnol. 2014 Jun 1. doi: 10.1038/nbt.2877. Enhancer loops appear stable during development and are associated with paused polymerase Ghavi-Helm et al. (LA: Furlong) Nature. 2014 Aug 7;512(7512):96-100. TFBSshape: a motif database for DNA shape features of transcription factor binding sites Yang et al. (LA: Rohs) Nucleic Acids Res. 2014 Jan;42(Database issue):D148-55. Genotype-environment interactions reveal causal pathways that mediate genetic effects on phenotype Gagneur et al. (LA: Steinmetz) PLoS Genet. 2013;9(9):e1003803. Now in its seventh year, the RECOMB/ISCB Conference on Regulatory and Systems Genomics, with DREAM Challenges and Cytoscape Workshops is one of the premier annual meetings in the fields of regulatory genomics, systems biology, and network visualization. This multidisciplinary conference brings together both computational and experimental researchers from across the world to discuss recent discoveries about genomic and molecular regulatory networks as well as innovative, integrative methods for developing a systems-level understanding of biological activity. Photos from the DREAM Challenges program here. The 2014 program book is now available for download (pdf). 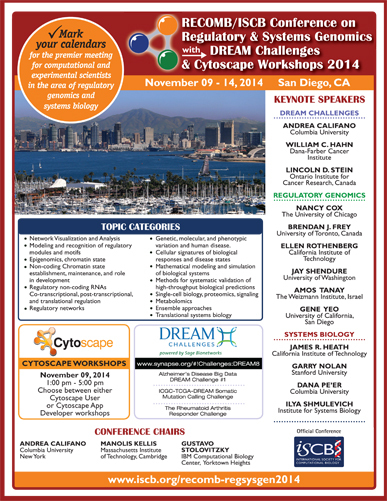 We have added a pair of Cytoscape Workshops on November 9, preceding the main meeting. Choose between either user or developer tutorials. The user tutorial will introduce network analysis and visualization principles and cover how to most effectively use Cytoscape in your research. The developer tutorial will focus on how to develop a Cytoscape App to extend the functionality to novel data types, web services, visualizations, algorithms and more. In addition to the workshops, Cytoscape posters will be featured concurrently with the DREAM program on November 10, and Cytoscape App Expo oral presentations will be included in the Systems Biology program on November 11 and 12. This year’s conference will take place on November 09 - 14 at the Wyndham San Diego Bayside in San Diego, California. Located on the waterfront not far from the popular Gaslamp Quarter, the hotel is within walking distance of shopping, dining, and nightlife. A selection of videos from our 2013 conference in Toronto is now available. You can also download the 2013 program booklet (pdf) or see the Top Ten Paper Awards. The City of San Diego will be hosting a Veteran’s Day Parade on Tuesday, November 11, 2014. The parade will commence at 11 AM and end at 2:00 PM. Please make note of the road closures that may affect the Wyndham Hotel shuttle routes. 8:00 AM to 2:00 PM: Harbor Drive (northbound and southbound) from Grape Street, past Broadway, to Pacific Highway. Parade organizers will open the street as the parade progresses and traffic will be back to normal by 2:00 PM. Also, please be advised that between 8:00 AM and 2:00 PM, the hotel shuttle will have to take a longer route (via pacific highway) to the airport. Due to this, and the traffic on Pacific Highway, it may take about 20 to 30 minutes to get to the airport. We advise that you schedule your departure accordingly. The RECOMB/ISCB Conference on Regulatory and Systems Genomics, with DREAM Challenges and Cytoscape Workshops is one of the premier annual meetings for computational and experimental scientists in the areas of regulatory genomics and systems biology. The conference will be held in San Diego, CA, USA. The conference is expected to attract 350 delegates many considered the world’s top researchers in systems biology and regulatory genomics. Enhanced by the DREAM Challenges and Cytoscape Workshops, sponsors can be assured their support of the conference aids in continued research and dissemination of knowledge in this diverse field. We look forward to welcoming you to San Diego and being a part of this exciting conference. Exhibit showcase space, with 6ft table. Please note the showcase is designed for pop-up displays, approximately 8 ft. wide or a tabletop exhibit.